A 14-year-old suspected female suicide bomber (names withheld) has opened up on how Boko Haram groomed her to kill. 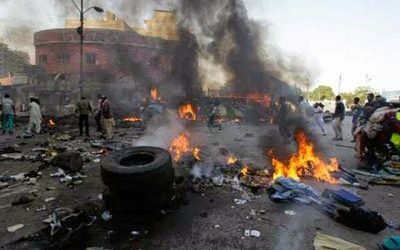 The suicide bomber, in her confession to the Nigerian Army, said Boko Haram leaders chose her to detonate an Improvised Explosive Device (IED) in Maiduguri, Borno State, because she refused to get married to members in Sambisa. She was among three suspects arrested by the military when they allegedly went for a suicide mission at a military facility in Jakana, in Maiduguri. The suspect told the News Agency of Nigeria (NAN) in Maiduguri, yesterday, that she was sent on the mission to detonate the device because she refused marriage proposals from three Boko Haram terrorists. According to the suspect, she was abducted with her father, Usman, by Boko Haram insurgents in Gwoza, Borno, in 2013 and added that she and her father were running to Mandara mountain for safety when they were abducted. The suspect said they wanted to travel to Madagali in Adamawa where her father sold cows, before Boko Haram insurgents attacked Gwoza. “I have spent three years in the hands of Boko Haram. Three different Boko Haram (terrorists) proposed to marry me and I refused. Two among them were commanders (amir). “When I refused for the third time, one of the commanders became furious and threatened to kill me and my father. “I told him I would rather die than marry a Boko Haram (terrorist). “So, after one week, they said since I have refused to get married, I should be taken to Maiduguri for a suicide mission. So, three of them held my hands and they injected me. “Then, I never knew what happened again. I was taken to a herbalist, who, after I regained consciousness, told me that I had been with him for 30 days. “He told me he was preparing me for a mission. “So he gave me some water to drink. I don’t know what it tasted like, but, I drank it. So, he said they would come and pick me today. “At about 7:00p.m., three Boko Haram (members) came with a male and a female. They were also recruited for the mission like me. “We spent one and a half days on the road to Maiduguri. It was when we got to Maiduguri that they strapped the bombs on our bodies. “At that moment, I knew I was going to die, so I started crying. I was watching when the first bomber, a female, detonated her explosive close to a military checkpoint which killed no one but herself. “The second, a male, was killed by the military before he could detonate his. “At that time, something told me to remove my own IED and surrender, which I did. I was surrounded by soldiers and policemen and I fainted. “When I woke up, I discovered that one of the policemen at the checkpoint was one of my mother’s brothers. I think that was the reason I survived,’’ the suspect said. Meanwhile, outgoing Theatre Commander of Operation Lafiya Dole Maj. Gen. Lucky Irabor disclosed the suspects were being de-radicalised at the military detention facility. “We have quite a number of them here in our facility. We have been profiling them and making them feel comfortable. “So far, from their testimonies, they usually tell us that they were brainwashed by some sort of charms to commit suicide,” Irabor added.